The typhoon forced voters to brave torrential rain on election day. TOKYO (JAPAN) - A powerful typhoon left two dead, two missing and dozens injured in Japan Monday, moving northward off the Pacific coast after millions struggled to the polls for a national election. Authorities advised thousands living in coastal areas or near rivers to evacuate to shelters before Typhoon Lan, described as "very large and very strong", hit Tokyo and surrounding regions early Monday morning. 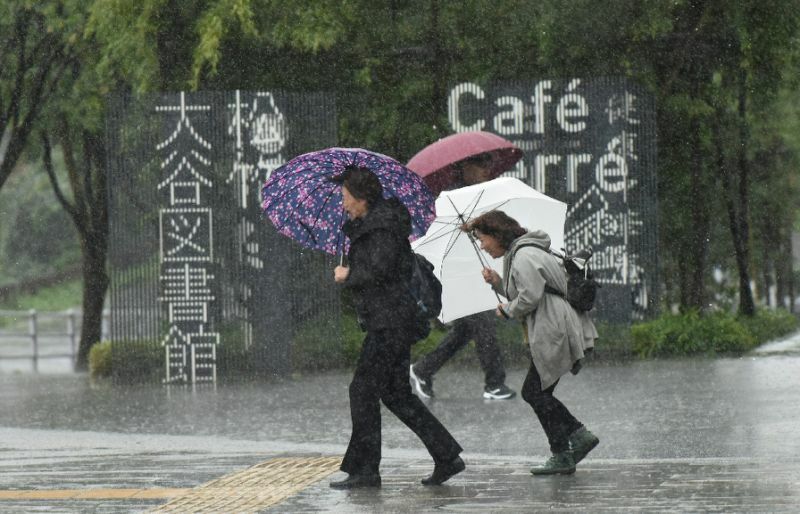 The typhoon left the Japanese archipelago by about 9:00 am (0000 GMT) after making landfall in Shizuoka southwest of Tokyo six hours before, the weather agency said. The storm, which had already dumped torrential rain over much of the country during the weekend, packed gusts up to 162 kilometres (100 miles) per hour, the meteorological agency said. Train operators suspended some commuter trains in Tokyo suburbs early Monday and cancelled some "Shinkansen" bullet trains in northern Japan after a blackout left passengers stranded overnight in the country's central region. Nearly 300 flights scheduled for Monday have already been cancelled, public broadcaster NHK said, after strong winds forced 500 flights to be grounded Sunday. Some ferry services in western Japan were also cancelled as the weather agency warned of high waves, landslides and floods across the Japanese archipelago. The typhoon claimed its first victims Sunday as a male passer-by died when scaffolding collapsed on him at a construction site in Fukuoka in western Japan. A 70-year-old man was found dead after he dived into the sea to grab a rope from another vessel as he attempted to escape from his troubled boat, a coastguard told AFP. Two more people were missing after landslides in Osaka and Wakayama prefectures, private broadcasters FNN and TBS reported. At least 89 people were injured across the nation, while a 85-year-old man was unaccounted for after his house was hit by landslides, NHK said, while the government confirmed 17 injuries. On Sunday, Prime Minister Shinzo Abe ordered his minister in charge of disasters to be ready to mobilise rescue and evacuation forces, including troops. Voters in the capital braved torrential rain and driving wind on election day, but turnout across the country was expected to be only a fraction higher than the all-time low, boosted largely by people voting early to avoid the typhoon. Near complete projections Monday showed Abe's ruling conservative coalition was on track to win a two-thirds "super-majority". The foul weather did affect the election, with ferries to a remote island in the west cancelled due to high waves, forcing officials to suspend the counting of votes there. On Saturday, voters on remote southern islands in the path of the storm cast their ballots early, heeding a call from Abe. A powerful typhoon left two dead, two missing and dozens injured in Japan Monday, moving northward off the Pacific coast after millions struggled to the polls for a national election. Authorities advised thousands living in coastal areas or near rivers to evacuate to shelters before Typhoon Lan, described as "very large and very strong", hit Tokyo and surrounding regions early Monday morning.